Principal photography wrapped on Star Trek The Motion Picture on January 26, 1979. Most of the cast and crew headed off to other work. But director Robert Wise and those working on the film’s post production stayed on the job. They had less than 11 months to get the film ready. The Final Shot The last scene shot for the film was the one that saw Decker and the Ilia-probe merge. The lighting for this shot was so bright that actors Stephen Collins and Persis Khambatta both complained about vision problems the following day. Of course, their vision did eventually clear. When that shot was complete, everyone went home and director Robert Wise went on a short vacation. When he returned, it was time to start editing. They had a lot to do in a short period of time because of delays. Visuals Were Behind the Eight Ball Production on the film had run over schedule. On top of that, the visual effects were essentially non-existent. Abel and Associates, the company contracted to create the film's visual effects, had accomplished very little by the end of January 1979. That firm was fired and Douglas Trumbull was brought in. He had 500 special effects shots to create and only six months to do them. 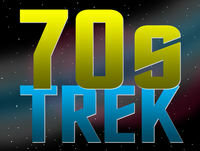 We cover Trumbull and the visual effects in Episode 102 of 70s Trek. Music Another area that needed completed was the musical score. Composer Jerry Goldsmith had been hired to create the soundtrack. It proved so complicated, though, that Goldsmith was still recording music on December 1, just five days before the premiere. Editing Of course, the film needed to be edited. Todd Ramsay had been piecing together shots since production started in August 1978. But as the production on the visual effects and the musical score dragged on, it pushed the editing of the film back further. By the fall of '79, it became obvious that there would not be enough time for a preview of the movie. So as the final elements were added the film had to be copied for the over 3,000 theaters that were to show it around the country. Shipping Rows upon rows of film canisters sat on the floor of a MGM sound stage waiting for the final reel to come out of the developer so they could all be shipped. The Motion Picture did arrive in theaters on time, but director Bob Wise didn't think of this version as a final cut. He felt that things had been rushed so much that the film that went out was really just a rough cut.